Apperley Bridge Marina is a place on the waterways minor waterways place place on the waterways major waterways place village town city on the Leeds and Liverpool Canal (Main Line - Wigan to Leeds) between Saltaire Road Bridge No 207A (Saltaire) (4 miles and 5½ furlongs and 5 locks to the west) and Armley Mills Bridge No 225 (7 miles and 2 furlongs and 7 locks to the east). The nearest place in the direction of Saltaire Road Bridge No 207A is The Moorings Winding Hole; ½ furlongs away. The nearest place in the direction of Armley Mills Bridge No 225 is Harrogate Road Bridge No 214A; 1½ furlongs away. Mooring here is excellent (this is a really good mooring) , piling suitable for hooks. Mooring is limited to 14 days. 1001 Harrogate Road, Apperley Bridge, BD10 0LT — 339 yards to the southeast. Apperley Bridge — 585 yards to the northeast. Apperley Road, Apperley Bridge, Bradford, BD10 OPU — 221 yards to the northwest. 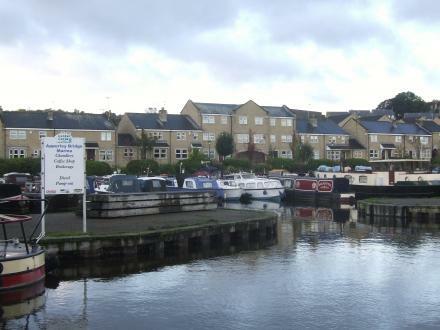 Apperley Bridge Marina, Waterfront Mews, Apperley Bridge, BD10 0UR — 33 yards to the south. Bradford — 1619 yards to the west. 101 Town Lane, Bradford, BD10 8LP — 1624 yards to the west. 23 High St, Idle, BD10 8NB — 1517 yards to the west. Bradford — 1274 yards to the west. Albion Mills, Albion Road, Bradford, BD10 9TQ — 676 yards to the southwest. 54 Leeds Road, Bradford, BD10 9SX — 562 yards to the southwest. Waterfront Mews, Bradford, BD10 0UR — 28 yards to the south. Apperley Bridge — 273 yards to the southwest. 8 Sedbergh Close, Bradford, BD10 9FH — 1178 yards to the southwest. Woodlands Close, Bradford, BD10 0 — 1051 yards to the northeast. 109 WHITFIELD MILL,, Bradford, BD10 0LP — 148 yards to the southeast. Woodlands Drive, Bradford, BD10 0 — 763 yards to the north. Apperley Lane, Apperley Bridge, BD10 0NS — 809 yards to the northeast. 927-929 Harrogate Rd, Bradford, BD10 0RB — 558 yards to the south. 3 Averingcliffe Road, Bradford, BD10 9HQ — 1152 yards to the south. 4 bradford road, Bradford, BD10 9PP — 1417 yards to the west. Bradford, BD10 0UF — 258 yards to the south. Idle — 1317 yards to the northwest. Apperley Bridge — 748 yards to the east. The Little Theatre, Malt Shovel Yard, Westfield Lane, Bradford , BD108QB — 1591 yards to the west. High Street, Bradford, BD6 1QR — 1514 yards to the west. Bradford, BD10 0AX — 241 yards to the northwest. Bradford — 109 yards to the southeast. 2 The Covet, Bradford, BD10 9TH — 439 yards to the west. Harehill Road, Bradford, BD10 8 — 1552 yards to the northwest. Leeds — 1565 yards to the south. Yew Tree House, Idle, Bradford, Bradford, BD10 9UL — 1393 yards to the west. Bradford — 1168 yards to the south. Bradford — 516 yards to the southwest. Bradford — 1230 yards to the southwest. 1027 Harrogate Road, Apperley Bridge, BD100 — 351 yards to the east. Bradford — 1201 yards to the west. Leeds Road, Idle, Bradford, BD109 — 1290 yards to the northwest. bearBOATING Ltd, Apperley Bridge, BD10 0UR — 22 yards to the south. 32 Town Lane,BD10 8NS, Idle — 1520 yards to the west. Leeds, BD10 — 1549 yards to the west. Thorpe Edge — 1284 yards to the southwest. 558 yards to the northeast.